Home / GST-Tally / TallyERP.9 Lessons / How to Maintain Accounts with or without Inventory in TallyERP.9? How to Maintain Accounts with or without Inventory in TallyERP.9? First option is maintain accounts only. Tally gives you default option to maintain accounts only. Through this you can only maintain your accounts. There is no option for use inventory in only accounting mode. You can setup GST, TDS, VAT, Payroll etc. in all 3 modes. Select option "Yes" to Integrate Accounts and Inventory. This option enable access feature in your Tally which is available on gateway of Tally named Inventory Info & Inventory Vouchers. See below image. Under Inventory Info you can create Stock Groups, Stock Categories, Stock Items, Unit of Measurement, Godowns, Price List, Voucher Types, Statutory Info Etc. This feature will merge your inventory with your accounts. For Example, if you purchase 100 Nos. Goods @ 1000 and sold 50 goods @ 1000 then your closing stock of 50 Nos @ 50000. It will appear in your profit & loss account and you can manage your inventory with accounts through this feature. There is no requirement for manual working of inventory, tally can solve your all inventory issues. Third option is manage inventory with Accounts separately. Through this option you can manage your inventory separate. In above image, we select both option as no. This will not effect in your accounting nature or voucher data or any kind of ledger change. 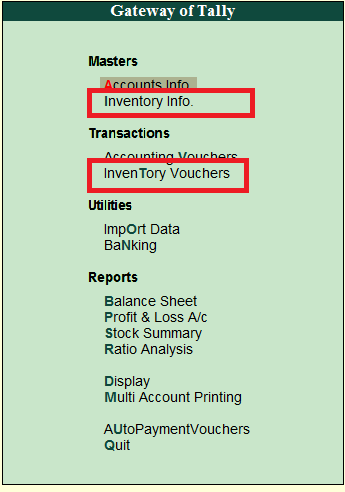 But you can manage your inventory and accounting in same tally data. This option is very useful because if you want to change inventory you can easily change there will be no impact on accounts if you manage your inventory through this option. Passing of inventory vouchers will not change your profit & loss closing stock and you have to enter your closing stock value manually in Profit & Loss. It means in same data you have two different work options one is of accounting and second is of inventory but both will be work separately.